​Are you in the market to rent a yacht in Miami? By Yacht Rentals Miami, Miami's all out luxury yacht, boat, and jet ski rental company. "We charter and lay out the red carpet to individuals, couples, and big party groups for any occasion. Because here at YRM, we believe everyday should be a special occasion!" Our mission is to create a safe, fun, and silky smooth experience for our clients to create an unforgettable day. 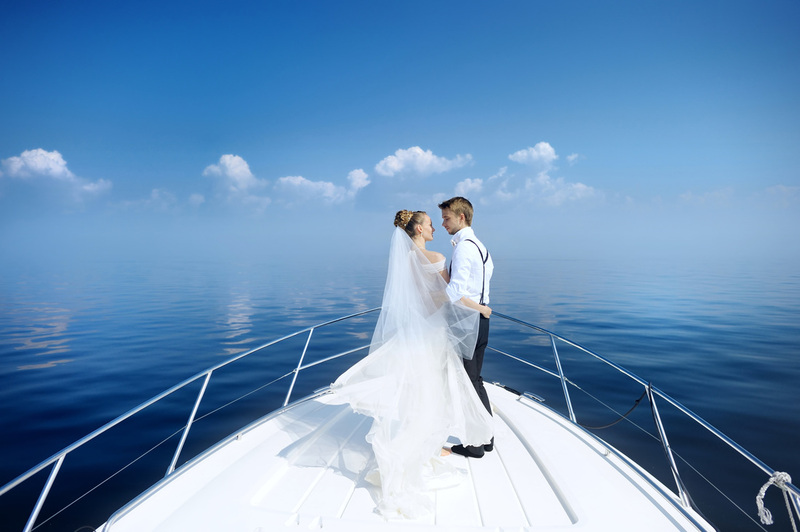 We do yacht charters for all different types of functions and special events including weddings, proposals, corporate functions, sporting events, birthdays, bachelor parties, bachelorette parties, proms, dining in style, and or anything else your little heart desires..
1. Our yachts are upscale and lavish. Feel like celebrity once you jump on one of these bad larrys. 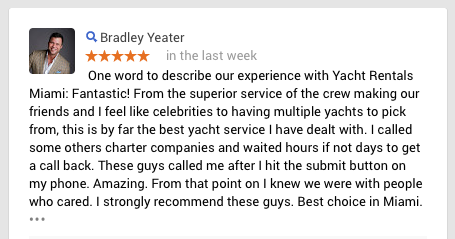 We are tickled, when Miami, FL residents rave after seeing how nice the yachts are and the experience they have with us. 2. Our charter service is accommodating. Our company is in business because we believe time is valuable and we value our clients time. We will do our upmost to put you first and work around your schedule. 3. Class act professionally trained team. YRM's captain's and first mate's infectious, passionate personalities tops that of the energizer bunny. They will have your guys back like a chiropractor. You will will be in caring, professional, loving hands. 4. Fun in the bays soaking in the rays. If you want to get your bronze on and let the air keep you cooler than cool aid.. we got you covered. Sit back, relax while we cruise from bay to bay of your choice. 5. Safety second, Nope.. safety first. Our number one goal is to create a fun but safe environment while everyone is having the time of their lives on our yachts. We are constantly aware of our surroundings and the environment we are in. 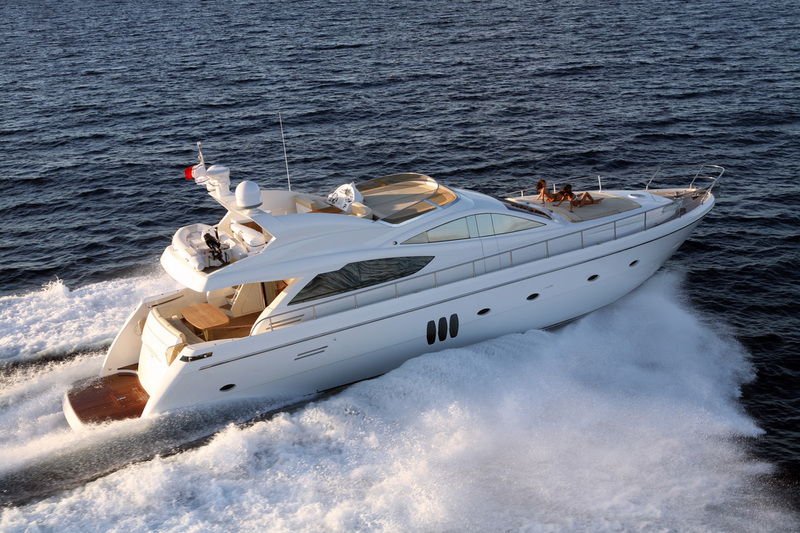 Miami yacht charters is fully insured and is one of the safest, fun things to do out in the Bay. Book your Miami yacht rental before someone else does! Cheers and we will see you out on the water. Renting a yacht﻿ in Miami Florida is the best decision you could ever make and it would be the sweet apple pie to your glorious trip. We are one of the most affordable yacht rental services in Miami and have always strived to create the greatest luxury boat rental at the absolute best price. If your looking to get a good deal on a yacht, then look no farther because we are the groupon coupon that doesn't expire if you know what I mean. YRM is confident we provide the best yacht rental prices. If you live in Florida, and you are looking to get to the coast to do some serious R&R on the beautiful waters in the bay, then come charter a yacht in Miami while one of our trained captains takes care of you with the upmost service and professionalism. Luxury is what our crew, team, and yachts scream. Whether your looking for the best party yacht rental in Miami, or your just interested in a relaxing, romantic time with your babe, we will take care of you from the beginning to the end. Let's say you and your family are just looking to get out on the ocean and casually cruise around for 2 to 4 hours. Whether you rent a yacht for a day from us or just book with us for a couple hours, we are more than happy to take care of you and your loved ones, no matter what your agenda is. Hey, say your not rolling to the coast with your family and your looking to get a little more rowdy. Don't worry, our team will get right on it to find you the best Miami party boat rental that comes with the sexiest prices in town. Sit back, relax because before you know it your going to be on a mouth melting yacht with some of your best buds doing what best buds do. I'll cheers to that! Our service and reputation is what we live by and it is the number one ingredient that keeps our clients happy and continually talking about us. Come get your classy yacht before someone else does! 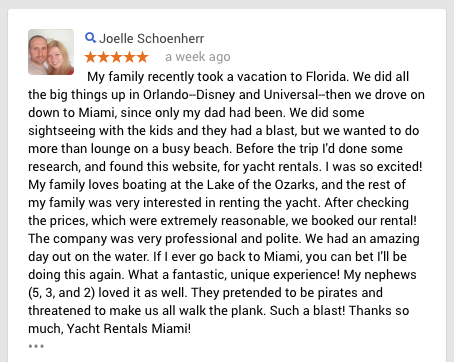 All types of people enjoy our luxury boat rentals. It's about time you check it out for yourself! "Best yacht rental in miami"
If your looking for yacht rentals in Miami Florida... then you have come to the right place my friend. Whether you are a local in the Miami area or tourist in Florida looking to have a good time out on the water, Yacht Rentals Miami has you covered and is here to make your miami party rental or family rental experience unforgettable. Step foot into your soon to be, wonderful white Miami yacht. The smell of freshly waxed fiberglass, and a glistening reflection from the warm inviting sunlight. The aroma, the tingling in your toes, is just the beginning to sensory overload.. it's finally happening. The day you have been waiting for. It's time, to get on the Miami yacht of your dreams and start cruising the bays with people you love. The freshly cleaned vinyl surrounding the boat and buffed out leather seats are just couple examples of what type of luxury you are soon to be immersed in. 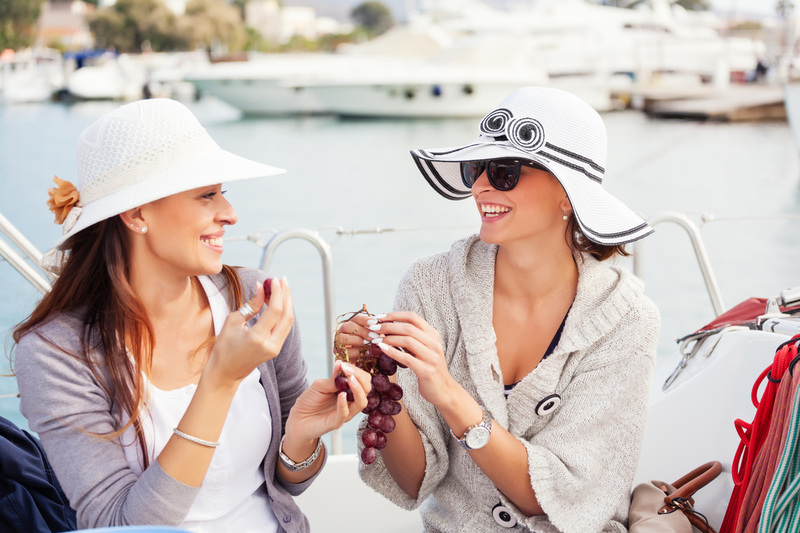 Our company also encourages our clients to have their yacht day experience catered, so they can maximize and enjoy their full day experience out on the water. What would a Miami yacht charter experience be without catering.. right? Either way, whether you have it catered or not, you'll still have the time of your life. Plus every Miami yacht charter comes with a captain to cruise safely to wherever you and your party wants to go. Yacht Rentals Miami is a pristine, professional company that provides a luxury yacht rental service to many surrounding cities and counties of the Miami area. Are you looking for a yacht rental in Fort Lauderdale, Miami Beach, Miami South beach, Miami North Beach, or other surrounding counties of Miami city? No worries, we got you covered. Our yacht rental service in Miami takes pride in not only providing this service to Miami Beach but practically any location throughout Miami and it's surrounding cities. Therefore, booking a party yacht or a standard yacht charter, is probably the best choice you could make. Yacht Rentals Miami highly recommends calling IMMEDIATELY at 305-964-8115, because we fill up fast and we want to see you out on the Yacht of your dreams. Safe travels here and see you out on the water!